For those that have been keeping up, I am now the proud owner of a MacBook Air. I originally purchased it to use as a learning aid to get better at working on OS X Snow Leopard and Lion. I also decided to see if I could use it to replace carrying my behemoth Lenovo w701 around to do simple things like console connections. I’ve done my best to spend time in the last month working with it every day and trying out new software to duplicate my current job functions. Now that I’ve got a handle on things, I figured I’d share what I’ve learned with you in a manner similar to my last software blog post. This was the first program I downloaded after I logged into my MacBook. If you are a network rock star, it should be your first download as well. This program is the terminal on steroids. Tabs, split window panes, search-in-window, and profile support top the list of the most needed features for someone that spends most of their day staring at a CLI window. I don’t even open the Terminal.App program any more. I just use iTerm2. This program replaced PuTTY for me and did a great job of replacing TeraTerm as well. The only thing that it lacks is the ability to use a serial console connection. I think that’s more of a single-purpose use case for the iTerm2 folks, so I doubt it will ever be rolled into the program. All things being equal, this will probably be the most useful program you’ll download for your Mac. The console is where I live. 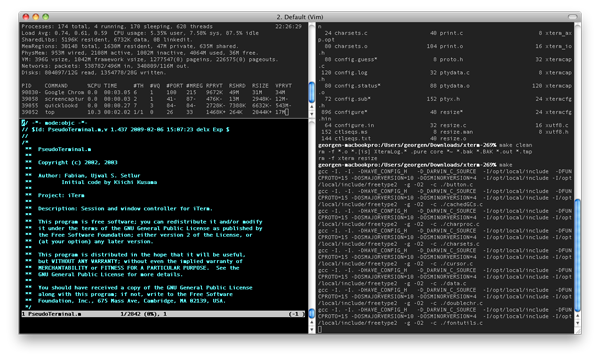 I spend more time staring at CLI screens that I do my own kids. The inability for me to access the familiar confines of a serial connection is a deal breaker. I was a little apprehensive about serial console access on the Mac after hearing about some troubles that people were having after upgrading to OS X Lion. I pulled out my trust Prolific PL-2303 serial adapter and plugged it in to test the driver support. I had no issues on Lion 10.7.2, but I’ve been told that some may need to go to the Prolific site and download the newest drivers. As a side note here, I had the exact same issues when I upgraded to Windows 7 64-bit on my laptop, so I think the problems with the adapter are based on the 64-bit drivers and not necessarily on your particular OS. Once I had the adapter working in the OS, it was time to find a program to access that console connection. ZTerm kept coming up as the best program to do that very thing. Some of the other serial connection programs (like CoolTerm) are focused on batch serial connections, like sending commands to a serial device in programming. ZTerm allows you to have interactive access to the console. You can also do captures of the serial output, which is a feature I love from TeraTerm. That way, I can just type show run and not have to worry about copying and pasting the input into a new Notepad window. A quick note – when launching ZTerm for the first time, the baud rate of the connection is set to 38400. Since networking equipment only plays nice at 9600, be sure to change that and save your settings so it comes up correctly after that. Note that ZTerm is shareware and costs $20 to register. It’s worth every penny for those that need to access equipment through old fashioned serial links. OS X has its own built-in TFTP server. However, I’ve watched competent network rock stars struggle with permissions issues and the archaic CLI needed to get it running. In the comments of my original software blog post, Simon Naughton (@norgsy) pointed me toward Fabrizio La Rosa’s TFTPServer GUI configuration tool. This little jewel helps you get the right permissions setup on your TFTP service as well as letting you point the TFTP service to a specific directory for serving files. I love this because I can keep the remote machine from needed to sift through large numbers of files and keep only the necessary files located in my TFTP directory. I can also enable and disable the program in a flash without needing to remember the five argument CLI command or forgetting to sudo and get a failed error message. Do yourself a favor and download this program. Even if you only ever use TFTP once, you’ll be glad you have this little tool to help and won’t have to spend hours sifting through documentation and forum posts. My favorite RSS reader for the iDevices, Reeder allows me to digest my RSS feeds from Google Reader in a quick and clean manner. No ads, no fluff, just the info that I need to take in. Thankfully, Silvio Rizzi also put out a version for OS X as well. I keep this one up and running at all times in a separate screen so I can flip over and see what my friends are posting. It’s a great tool that allows me to be in the know about what’s going on. It’s $5 on the Mac App Store, but once again worth every penny you pay for it. There are a ton of other apps that I use frequently on my MacBook Air, but the ones I’ve listed shine above all others. Those get a workout and some of the reasons why my little adventure with OS X is staring to grow on me. Yes, there are apps that don’t really have an equivalent right now. I’ve managed to avoid the need for modeling/graphics software so far, so I can’t compare the alternatives to Microsoft Visio. I spend a lot of my time using Netformx DesignXpert, which I can’t use natively in OS X. Beyond that, it’s just a matter of deciding what I want to do and finding a program that will do it for me. There are a lot of options available, both in the Mac App Store and out on the web. The trick with a Mac isn’t so much about worrying how you’re going to do something, but rather what you want to do. The rest just seems to take care of itself. This entry was posted in Apple, Review by networkingnerd. Bookmark the permalink. Did ZTerm require you to install some backward compatibility nonsense? Pre-Lion, I think we had to run ZTerm with Rosetta, which was a show-stopper for some OSX purists. What’s the current situation? 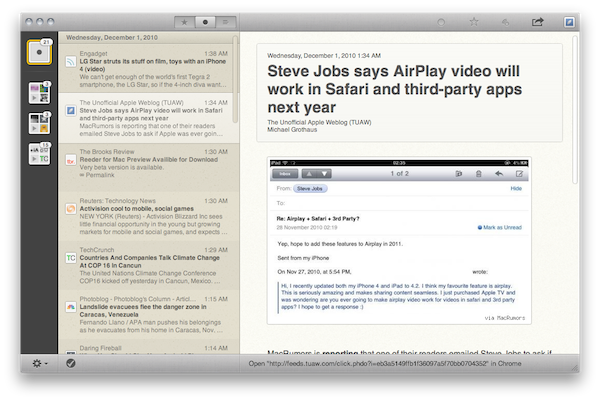 Also, what’s the scoop with sending breaks with Lion? 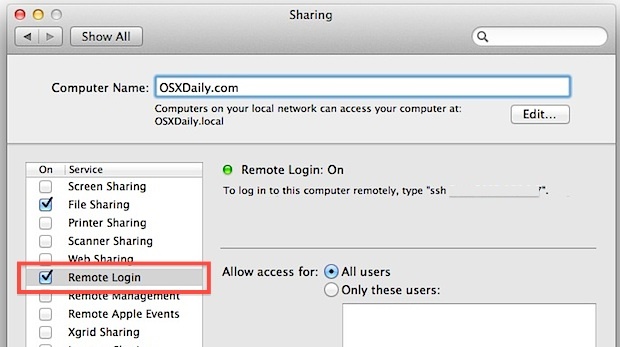 Is sending a break signal supported by the PL2303 drivers in Lion, or are you using ZTerm’s breakSim hack? ZTerm was a Rosetta app right after Lion came out, so there were some compatability issues. As of 1.2 it is a universal binary and I’ve not had any issues with it. I haven’t had to send a break signal to ZTerm yet, so I’ll dig into this next week when everyone else is on vacation and see what’s going on for me. Thanks for the heads up. I was a Zterm user for a long time; until I discovered Zoc. Much better and less crashy. I console from iterm2 just by using the screen command. Screen /dev/tty.USBserial or something similar. Before that zterm was my go to app. SecureCRT for Mac does all of this … just sayin. Aaaaaa! Ok, I have tried and tried and tried to use the above mentioned tftp server utility when upgrading even an old 3550’s IOS. The website even says there are issues with Cisco. Do you have pointers that can rescue me? Anonymous, SecureCRT costs a minimum of $129. If it’s anything like the MS-OS version I had to use in the past, I want nothing to do with it. How do you do a DRS from UCONN or CM using the built in SFTP? I keep getting failures.